We love collectibles here at Geek Pinoy, even if we can't afford all of 'em. So we just post about the stuff we only dream about collecting, which in some cases help us sleep at night. 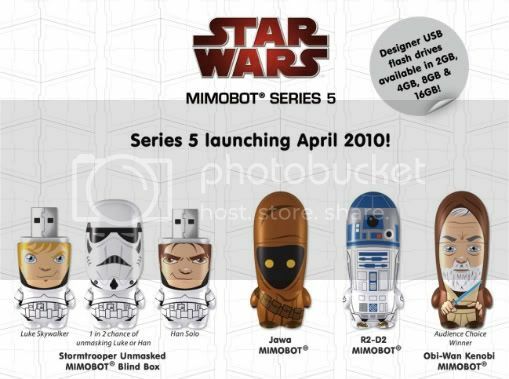 A good example of our martyrdom is Mimobot's Star Wars Series 5 USB Flash Drives which feature all new characters like Obi-Wan Kenobi, R2-D2 and a Stormtrooper you can unmask and become either Luke Skywalker or Han Solo. Each drive has a capacity of 2GB - 16GB and would set you geeks back around 30USD - 90USD or about 1,500PHP - 4,000PHP respectively. There's a cute promotional clip after the break which will take about 59 seconds of your precious time, but I guarantee it's worth it.